Diller on leaving the top spot at IAC: "The company wasn't being managed correctly"
FORTUNE -- Barry Diller it seems has been pondering the future lately. Today he took action. Every summer Diller takes some time off to do a deep think. "I call it my summer project," he says in an interview with Fortune. "My executives always brace themselves," [for his return.] The first Monday this past October was no exception. 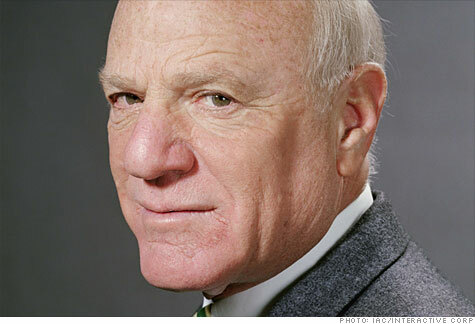 Diller informed his charges that he wanted to step down as chief executive of IAC/Interactive (IACI), the ecommerce website company the media mogul built over the past 17 years. "I told them the company wasn't being managed correctly," Diller, 68, said. "I never thought I was a very good manager. I mean I am decent, but I want to go back to what I am good at, which is looking for opportunities to grow the business. Greg is a better manager than I am." Greg being Greg Blatt, 42, the newly named CEO of IAC, who was formerly the CEO of IAC's stand-out property Match.com. IAC owns some 50 other websites including Ask.com, Citysearch, and The Daily Beast. But wait, wasn't there some other big news in Dillerland today? Like Barry buying out fellow billionaire John Malone's stake (held through his Liberty Media) in IAC for $220 million in cash and websites Gifts.com and Evite---worth another estimated $150 million? Why yes that happened today, too. So Barry, why do the exchange now? "Well, this is what we wanted to do for years now, but it took us two years to figure out because of tax rules," Diller says. "IAC holds so much cash, which wasn't a good strategic fit for Liberty as they try to get the right model for themselves. So it works for them. And we still have a billion in cash and no debt. This deal also is a way to shrink our capitalization, which we have done by 8%-9% today and by 50% over the past three to four years. That's good for earnings." Does this mean Diller is stepping back from the company? "That's ridiculous because now I have direct control over the company. If anything I'm stepping closer. Frankly my family and I want to be in this for the long term, but now the company will be managed more aggressively by Greg. The company needs a different kind of CEO. I have been so identified with this company." Ah, so the moves are also about succession and at least partly even looking beyond to the day when Diller is no longer active. So what exactly will Diller's role be? "One of my friends joked this was retirement with more control, but I don't think that's right," says Diller. "It will be different. I'm also still chairman of Expedia. But four to five years from now, who knows?" Does Diller have any deals in mind? "I don't have anything in mind," he says. "I never do. Nothing but curiosity."